Democratic primary voters are looking for a wide range of disparate things in their party’s 2020 standard-bearer. For some, the top priority is to nominate a progressive who boasts a long record of supporting single-payer health care, standing up to the financial industry, and championing organized labor. Others find the candidates’ policy platforms similarly compelling, and want, above all else, a nominee whose election would make history, and undermine the hegemony of traditional (i.e. patriarchal) gender roles. And many just want a nominee who will definitely beat Trump: According to a new Monmouth University poll, 56 percent of Democratic voters say they would take “a strong candidate against Trump even if they disagree with that candidate on most issues,” over a less-electable nominee whom they agreed with about virtually everything. Unfortunately, there is no Democratic 2020 hopeful who checks all of these boxes at once. But there could be. What if there were a Democratic politician who had been championing single-payer health care for two decades, and calling for a ban on stock buybacks — and for giving workers representation on corporate boards — before it was cool? What if she also helped lead the congressional opposition to the Iraq War in 2002, while earning a 100 percent pro-worker rating from the the United Food and Commercial Workers International Union — and 100 percent pro-choice rating from NARAL? Just for the sake of argument, what if this politician were also the first openly gay woman ever elected to Congress, the first LGBT person of any gender elected to the Senate — and had won reelection last year, in the single most important 2020 swing-state, by a double-digit margin, despite facing a barrage of Koch-funded attack ads, and refusing to compromise on her exceptionally left-wing policy commitments? Wouldn’t such a politician be a uniquely compelling 2020 candidate? 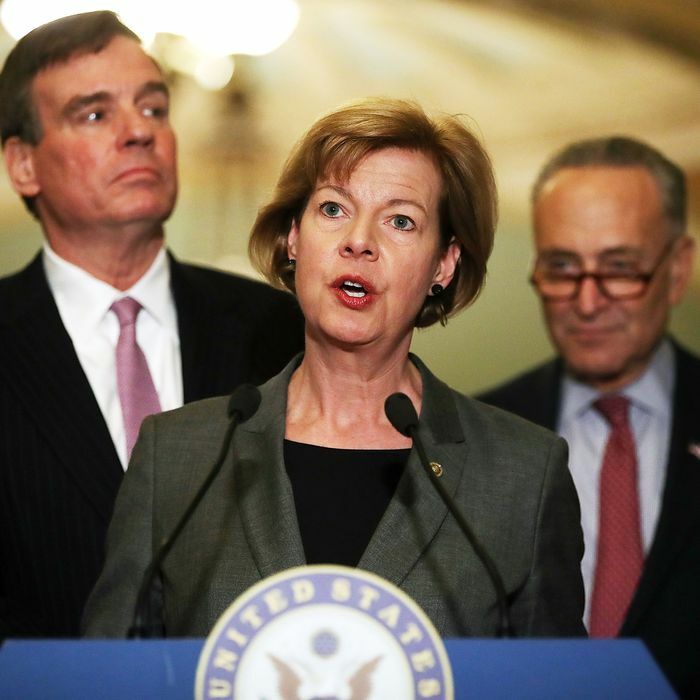 Which is to say: Wouldn’t Tammy Baldwin be a uniquely compelling 2020 candidate? “Electability” is a difficult quality to discern, and conventional wisdom about who does and doesn’t possess it is often badly misguided, and/or, distorted by the substantive preferences of the “conventionally wise.” But Baldwin has the most straightforward claim to that coveted attribute of any prominent Democrat. Judging from current polling — and Hillary Clinton’s 2016 performance — Donald Trump is very unlikely to win the popular vote in 2020. But he has a plausible chance of winning reelection, anyway, due to his relative strength among white, non–college-educated voters, who are overrepresented in the Electoral College. More concretely, Trump has a plausible chance of winning reelection because he has a plausible chance of winning Wisconsin. In 2018, Democrats won statewide races handily in Pennsylvania and Michigan, but just barely edged out Scott Walker in Wisconsin’s gubernatorial race. And Trump can afford to lose Michigan and Pennsylvania, if he retains Wisconsin, and all his other 2016 states. In other words, the Badger State appears to be the tipping point. Its central importance is affirmed by the Democratic Party’s tentative plans to hold its convention in Milwaukee. A lot can change between now and November 2020, of course. But at present, it really looks like whoever wins Wisconsin will win the White House. And Tammy Baldwin has been winning elections in Wisconsin for a quarter-century now. As insinuated above, she won reelection last year by nearly 11 percentage points, despite being a top target of the GOP donor class. What’s more, she didn’t win the overwhelming support of swing-state voters by campaigning as a fiscally responsible, pro-business candidate — or moderating on “culture war” issues to increase the salience of her economic populism. Rather, she was able to win as an unabashed progressive because she gets her state. Unfortunately, Baldwin appears to lack whatever personality disorder causes a human being to want to run for president. She is one of the only Senate Democrats to evince no interest in mounting a 2020 campaign, and has thus been almost entirely absent from the discussion. But it’s still possible that she can be persuaded. And given the strength of the case for her candidacy, those dissatisfied with the existing Democratic field should “draft” Baldwin before Beto.